Dogs are living more active, healthier lives now, and many dogs develop arthritis during their lifetime. The inflammation of the arthritic joint causes pain for the dog. When a joint hurts, the dog tries to avoid using it. As the arthritis worsens, his/her pain increases, walks become shorter and slower, muscles get weaker and smaller due to disuse atrophy. The weaker the muscles, the less they are able to support the bones and joints and additional stress on the joints occurs. This may lead to lost range of motion and decreased endurance. Our rehabilitation exercises improve circulation to the joints, strengthen the muscles and improve range of motion. 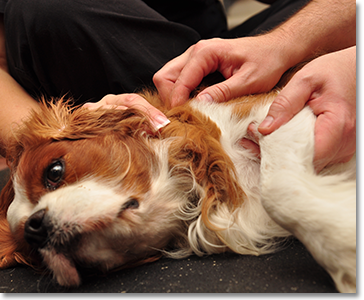 We offer a variety of methods to increase range of motion, minimize pain, and improve the strength of your arthritic dog. The buoyancy attained in the underwater treadmill relieves pressure on arthritic joints while maintaining a full, more comfortable range-of-motion. It provides an ideal exercise option for our arthritic patients.